For other versions of this character, see Solomon Muto (disambiguation). Solomon Muto, known as Sugoroku Mutou in the Japanese version, is the grandfather of Yugi Muto. Solomon gave Yugi the Millennium Puzzle as a present. He owns the Kame Game shop, where Yugi and his friends get several of the games they play. Solomon is the present day counterpart of Shimon Muran. His Japanese name, Sugoroku, is a Japanese board game. Solomon visited the Valley of the Kings in hopes of finding the Pharaoh's tomb. He hired two guides, Ahmet and Mushara to help him locate and navigate the tomb. The tomb was riddled with traps, which Solomon was able to discover. In one such trap, you had to walk with your left foot forward, as a sign of respect to the statues of the Pharaoh. Mushara failed to do so, and was attacked by the statues, and fell to his death. In the final room, Ahmet fell victim to a trap and was devoured by a monster. Solomon nearly fell victim as well, but was saved by the spirit of Pharaoh Atem. It was at the end of this room that he discovered the Millennium Puzzle. At some point in time, he lost a game and, as he promised himself, traded in his suit for overalls and began collecting games for years. Eventually, he opened up a game shop (the Kame Game) instead of continuing with his gambling days. Kaiba wants the "Blue-Eyes White Dragon" and decides to challenge Grandpa to a Duel. Grandpa loses, and his card is torn, because Kaiba has the other three "Blue-Eyes White Dragons" and unable to have a fourth copy, in his Deck, the card could only be used against him. Grandpa is sent to the hospital as Yugi Duels Kaiba. His soul is later sealed inside a card by Pegasus and freed after Yugi defeats Pegasus. Grandpa, Yugi, Tea, Joey, and Tristan later come across Rebecca Hawkins, who accuses Solomon of stealing her grandfather's Blue Eyes White Dragon card. Grandpa denies it, but Rebecca pays no attention. She challenges him to a Duel but ends up faces Yugi instead. Grandpa tries to convince her about what he said and tells her the tale of how he met Arthur Hawkins. She calls Solomon a liar, much to his frustration. When the Duel ended, Arthur reunites with Solomon. 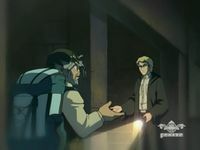 Rebecca finally believes Solomon's story and apologizes to Yugi, and he decides to face Arthur in a Duel. During the Domino City Battles arc, Grandpa is seen watching Yami Yugi play against Duke Devlin in a game of Dungeon Dice Monsters, on a screen in front of the building in which the two are playing. He frequently gets distracted by Duke's cheerleaders, who sometimes appear on the screen. When the Battle City tournament started, Solomon was eager to see the event. 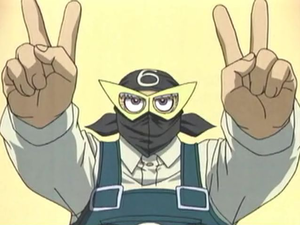 He was present for Joey Wheeler's three Duels against Espa Roba, Weevil Underwood, and Mako Tsunami, along with Téa Gardner and Tristan Taylor, offering support and advice for Joey. When Bakura was found injured, Solomon took him to the hospital. Grandpa got knocked out by Yami Bakura later on when he was checking on Bakura. Grandpa briefly appears in a flashback where he meets with Téa on a bench. Grandpa competes in Kaiba's KaibaCorp Grand Prix tournament under the alias "Apdnarg Otum"/ " Grandpa Muto (Backwards)" ("Mask the Rock" in the Japanese version), yet Joey manages to defeat him. The English name is "Grandpa Muto" backwards. The Japanese name is a pun of "Mask the Roku". Roku is six in Japanese, and "Sugoroku" means "double-six". The Deck used is an Ancient-themed Deck with consisting mostly of Rock monsters. The season begins with Solomon telling Yugi how he found the Millennium Puzzle. During this time in his youth, he was a gambler searching for even greater trials in order to test his luck. However, he did decide to have a penalty for losing even a single game: he would turn in his gambling suit and wearing overalls instead with the intention of collecting years instead of chips. He found the Millennium Puzzle in Atem's tomb and was spared from the traps, thanks to his analytical skills helping him overcome the man-made traps and his pure heart sparing him from being eaten by ka. He later was picked up from the airport in Egypt and was present for the Ceremonial Battle between Yugi and Yami Yugi. Solomon and the others later escape from the collapsing building where Yugi and the Pharaoh Dueled. In Yu-Gi-Oh! GX, he appeared at the end of Season 1. When Kagemaru Summoned all three of the Sacred Beasts, and they were shown draining energy from cards around the world, two children were shown crying in his card shop as the monster card images were drained away. He was shown walking up to see the cause of the commotion. At that time his face was not shown, only his overall. Later, in Season 2, Duel Academy students went on a field trip to Domino City. He was visited by Jaden Yuki and his friends who wanted to see Yugi. He answered them Yugi had been upset, and that card pictures had been faded away recently, referring to the Sacred Beast accident. When Hassleberry told him that Jaden sort out that mess, he decided to guide them through the city in return. As they left him behind, he was kidnapped by Thunder and Frost. Jaden and his friends spread out in order to find him. While Hassleberry and Syrus were lured and ended up Dueling his kidnappers, Jaden found him unconscious into a blind alley. Alongside Aster, they went to the place where the Duel was held, but came too late. Later in the night, Solomon gave Jaden, Atticus Rhodes, and the Slifers hamburgers in the bag for one of each. He also watched Jaden's Duel with T-Bone. Then he led Jaden and his remaining companions to Kaiba Land, where the latter Dueled Sarina with Aster. After the Duel, he promised Jaden to speak with Seto Kaiba in order to restore Sarina's consciousness, who left stuck in the virtual reality. Solomon's hair is now pointy on the top similar to the way it was shown in the Capsule Monsters. In the English dub, he is portrayed as senile. Although he wasn't shown when Jaden traveled back through time to Duel the younger Yugi, Yugi said goodbye to Solomon while heading to school. In this movie, during Paradox's plot to kill Pegasus, Solomon gets in the way and is killed along with Pegasus and some other citizens leaving Yugi as the sole survivor. Yugi then finds his bandana and cries over his death. The Crimson Dragon however takes Yugi back 30 minutes before Paradox's attack. Thanks to Yami Yugi, Jaden Yuki, and Yusei Fudo defeating Paradox, Solomon's death had been prevented (therefore, he hadn't died at all). Solomon goes with Alex Brisbane to find the pyramid of Alexander the Great. However, when they split up, Solomon finds Shadi's Capsule Monster game board and accidentally gets sucked into it. During his time there, Solomon found a Summoned Skull and used it as his primary monster. Upon the arrival of Yugi and his friends, Solomon helped them through the five trials to test if the Pharaoh was a true king by translating the messages they received on how to accomplish them. However, he lost Summoned Skull during the trial preliminaries, but soon received Alexander the Great's Curse of Dragon as a replacement monster. After being victorious in the trials, Solomon allowed the good half of Alexander to use him as a vessel to return to the real world. However, Alexander's dark half had possessed Brisbane and trapped everyone in the room where the power to rule the world was held. However, after a final battle to decide which ruler deserved the power, Solomon was returned to the real world once again and fled the pyramid with everyone else when it collapsed after its purpose had been fulfilled. He then talked the pilots of Joey's vacation plane into taking him and Brisbane back to Domino. In the English manga, Sugoroku's family name is usually spelled Mutou but is sometimes rendered as Mutoh. His family name is rendered Mutou in the uncut anime DVDs. In the English anime his name is Solomon Muto. All of the versions of the dubbed anime of Indo-European languages use Solomon Muto. The Spanish, French, Dutch, Danish, Swedish, Norwegian, and Italian versions of the manga use Sugoroku Muto. The German version of the manga uses Sugoroku Mutô. The Brazilian Portuguese version of the manga uses Solomon Muto. In Yu-Gi-Oh! The Eternal Duelist Soul and its two successors, Sugoroku is known as Trusdale. In other video games and by most people in the anime and manga he is simply called "Grandpa". In the ani-manga version of the movie he is Sugoroku Muto. In the English Yu-Gi-Oh! The Duelists of the Roses video game, he is Jasper Dice Tudor. 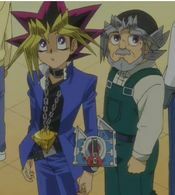 Solomon Muto is Yugi's grandfather and with his father's absence, he is Yugi's ultimate provider. He is smart, kind-hearted, funny, silly, loving, resourceful, gentle, and, of course, grandfatherly. He is, however, attracted to beautiful women, such as Vivian Wong, which did get him in some trouble with the gang when he agreed to help her after she fixed his back. He is the one who taught Yugi and Joey how to Duel. He is a strong believer of the Heart of the Cards, having taught both Yugi and Joey that concept, which both follow proudly. When he taught Joey he was strict, giving all sorts of lessons and usually being tough on him, but still encouraging him on how much he has grown, and is proud of him. Chances are he was the same way with Yugi when he taught him. Solomon loves games of all sorts, which may be because of his former gambling nature, and is even willing to go to dangerous places, such as during the non-canon Capsule Monsters adventure, to see and experience new games first-hand. Yugi's Duelist Kingdom Deck was once Solomon's, passed on to Yugi. In the manga, he uses one card that Yugi does not later use, "Hobbit". The only card that Solomon didn't give to Yugi was "Blue-Eyes White Dragon". This card was destroyed by Seto Kaiba. During his participation in the Grand Championship, Solomon uses an "Ancient" Deck based around the "Ancient Dragon", which can be revived whenever it is destroyed as long as he has "Ancient City" in play. However, the card is very difficult to play, requiring a set of six other cards and several turns to set up. According to Arthur Hawkins, the Grand Championship was the first time Solomon was able to call the "Ancient Dragon", and in the dub is implied to be the only person Arthur knows to have ever done it. Besides his "Ancient" cards, Solomon tests Joey's reliance on luck with "The Legendary Gambler" and "Ordeal of a Traveler". In Capsule Monsters he uses some of the capsules that were cards in his old Deck he gave to Yugi. Solomon is the first opponent available to the player who uses an Exodia Deck (the other opponents are Rare Hunter and Simon whose Exodia Decks are much more potent). However, since he is a tier one Duelist, his cards are very weak, and he doesn't have many cards that enable him to draw, presenting himself with a very difficult challenge of acquiring all five Exodia cards in his hand. Still, he uses 1 copy of Blue-Eyes White Dragon, although he makes a habit of Tributing even this card to summon his Giant Turtle Who Feeds on Flames. Prior to him settling down in his game store, Grandpa was a world class gambler and sported a hairstyle similar to Yugi's (although with a fedora). After acing every game of chance he ever competed in, he made a bet with himself. If he should ever lose a game, he'd retire, open a store and wear overalls for the rest of his life. That said, it would appear he eventually lost a game. The man displayed on Solomon's "Legendary Gambler" is himself as a young man, meaning that Solomon is playing a card that refers to himself as a legendary gambler. In the English version of Yu-Gi-Oh! GX, Grandpa has a "Blue-Eyes White Dragon" in his shop despite the fact that Seto Kaiba ripped his only "Blue-Eyes White Dragon" in the first episode of the second series anime. However, this is not a mistake, as that same card was shown taped back together following Yugi's Duel with Rebecca in episode 42, and was also later seen restored at the end of the episode. A running gag in the series' dub is Solomon muttering "not again" when he is attacked before he faints. He mutters this line when attacked by Yami Bakura, and in Yu-Gi-Oh! GX when he is attacked by Thunder. Because Maddie Blaustein died in December 2008, Wayne Grayson replaces her in the role of Solomon in Yu-Gi-Oh! 3-D Bonds Beyond Time! (Grayson also portrays Lyman Banner in the same movie). When "Apdnarg" is introduced in season 5 Yugi says "Don't we know him". Yugi also knows who he is before "Apdnarg" gets unmasked. Grandpa Muto might have a Ph.D, as one of the guides who led him to the Pharaoh's Tomb referred to him as "Dr. Muto" at one point. Solomon is the last Duelist to be defeated by Joey Wheeler in a Duel. ↑ 2.0 2.1 "Character". 4K Media Inc. July 7, 2015. ↑ Yu-Gi-Oh! GX episode 49: "Rise of the Sacred Beasts, Part 2"
↑ Yu-Gi-Oh! GX episode 75: "Taken by Storm, Part 1"
↑ Yu-Gi-Oh! GX episode 76: "Taken by Storm, Part 2"
↑ Yu-Gi-Oh! GX episode 77: "J-Dawg and T-Bone"
↑ Yu-Gi-Oh! GX episode 78: "Mirror, Mirror, Part 1"
↑ Yu-Gi-Oh! GX episode 79: "Mirror, Mirror, Part 2"
↑ Yu-Gi-Oh! GX episode 179: "Farewell, Judai! A Tearful Graduation Ceremony"
This page was last edited on 7 July 2018, at 02:14.